Kim Komenich, whose photojournalism project in the 1980s on the Philippine Revolution nabbed a Pultizer Prize, is in town to present his work from the Philippines and to discuss his Watford City photo essay in progress for the Intersection Journal. Komenich’s visit comes 30 years after his Pultizer win and on the centennial of the award itself. Through a grant from the North Dakota Humanities Council written by Chad Ziemendorf of the Intersection Journal, Komenich will be telling Watford City’s stories. The event is one sliver of an evolution to bring more arts and culture to town, Ziemendorf said, who mentored under Komenich in 2009. Such corners include the Long X Arts Council and the Watford Market. In his visit, Komenich brings his experience in photographing people of the Philippine Revolution while catching locals in everyday moments and stories. “It’s been a whirlwinder so far,” Komenich said Thursday, July 7, after traveling Keene’s backroads with Ziemendorf throughout the day. From the McKenzie County Fair to flickering moments like a late-night basketball game, Komenich is after those everyday moments in what makes Watford City tick. His visit to Watford City is also a bit of a resurgence for him as he returned to daily shooting for the first time in six years after teaching. Komenich’s approach to shooting the area is research done in advance and catching scenes as they happen. Different shapes, colors, sounds and even tastes are evident here, Komenich added, saying any outsider could be struck by the landscape, but it depends on the photographer and what their subjects are. “I would much rather be photographing someone on a rig rather than photographing the rig from a distance,” he said. Interpreting the area from his outside perspective is another aspect of his visit, but his California credentials haven’t hindered him. “To the person, no one has said no,” he said. With the event Thursday night, Ziemendorf said he hopes the storytelling, purpose and value of journalism ring true. “I think Kim’s going to do that perfectly,” Ziemendorf said. Komenich said he hopes attendees can draw from the stories and events from his Philippine Revolution photos. While his Watford City trip may not be as hard-hitting as the events of a country in turmoil, journalism is still the common theme. 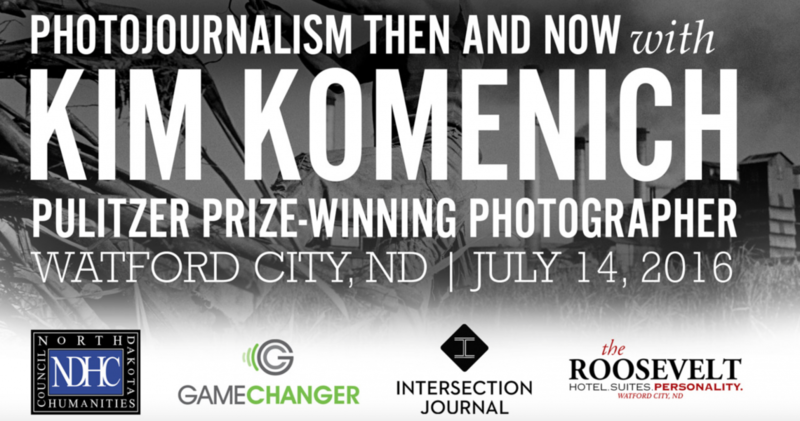 “Kim Komenich: Photojournalism Then and Now” is from 6 to 9 p.m. Thursday, July 14, at the Boulder Ridge Community Center at 906 Park Ave. W. The event is free and open to the public.